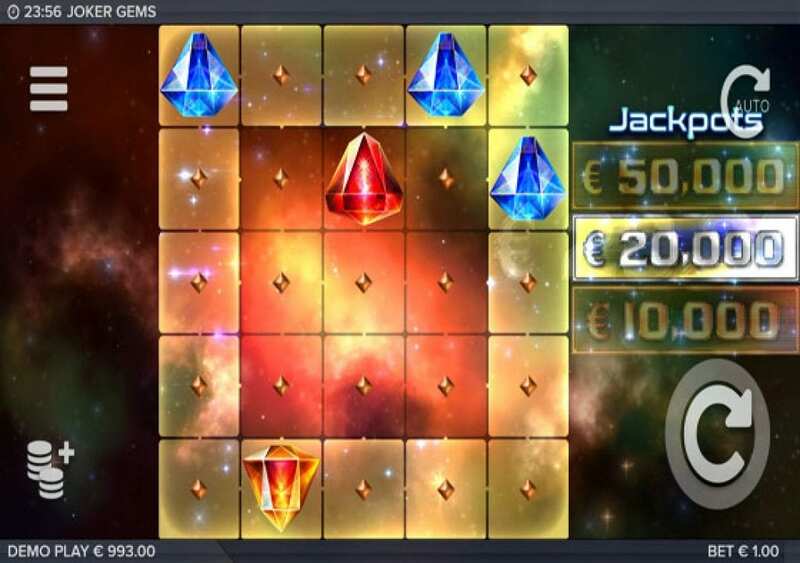 Elk Studios made sure that this fantastic game, Joker Gems, is available on a multitude of phones and operating systems. Therefore, you can enjoy this great title through your Android, iPhone, and Windows Laptops. You can also get a chance to spin it for free, right here with demo credits to see all that Joker Gems has to offer you, before playing it for real money. Joker Gems is one of the fantastic slot machines from the creative kitchen of Elk Studios, and it is far away from a typical slot machine. 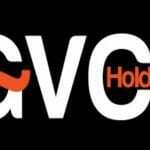 It has no wild icons, no paylines or ways to win, and no free spins. You might wonder how will you earn a reward, and you can do that by forming clusters of symbols. These clusters have to contain three symbols at least. 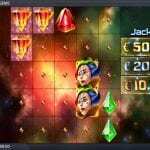 It has three jackpots, with the highest one amounting up to 50,000. So instead of the usual bonus features, there is a Light Chaser feature, the Jackpots, Sticky Clusters and more. Joker Gems by Elk Studios is a five-reel slot machine that takes place in the vastness of outer space. 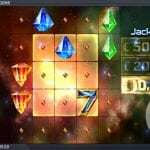 The slot machine has a 5×5 grid that is playable with stakes that start at 0.20 credits for each spin. The slot is available for free play here for fun, using demo credits so that you can check it out and see all of its offerings before playing it for real. The slot machine has a space theme, and this is why the slot machine takes place in outer space with the Joker and his gems floating in mid-air. The online slot machine has unique gameplay as it does not have any paylines and none of the standard bonus features like free spins and wilds. On the other hand, it has the cluster-pays format with different jackpots and the random Light Chaser feature. 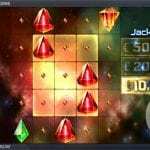 Joker Gems is playable on a wide array of devices that run on different operating systems. Therefore, it is playable on an Android device, an iPhone, or a laptop. Plus, you will be able to spin the reels here for free, to take it for a test drive before heading to an online casino to play it with real money. 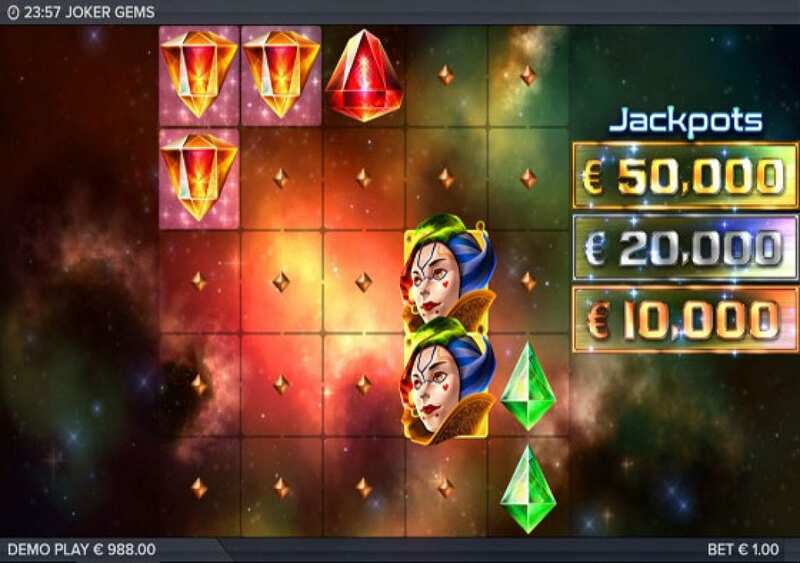 Joker Gems is a space-themed slot machine that will take you to outer space. You will join the Joker and his marvelous gems, which explains the title of the slot machine. The slot machine is highly rewarding, thanks to its cluster pays. The visuals of the slot are going to immerse you in the interstellar adventure that Elk Studios has to offer. Joker Gems by Elk Studios has five reels with no paylines or betting ways. The slot has a 5×5 grid with five rows of symbols. The slot machine has the cluster-payout system, which means you will need 3x matching symbols in a cluster at least to trigger a payout. You can form payouts with more than 16x symbols. The reels take place in outer space, and this is why you will see the interstellar stars in the background. As for the symbols that will land on the reels of the slot, they include the joker and the joker’s gems. These gems include a red ruby, an emerald, a golden diamond, and sevens and bar icons. Like most Elk Studios slots, you will see the spin button on the right side, as well as the auto spin button. As for the stakes and the paytable and settings, they are on the left side of the reels. 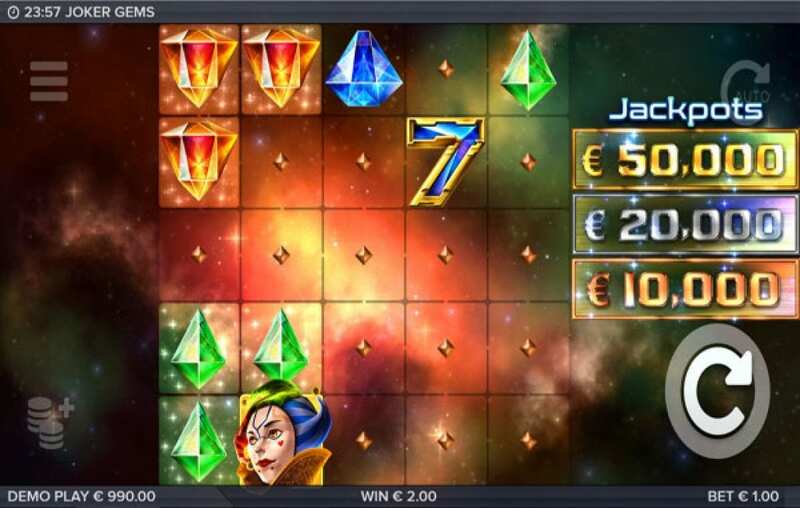 Joker Gems by Elk Studios is a five reeled slot that has five rows of symbols, but it does not have the usual line-based payout system, as it has the cluster-pays format. Therefore, for you to earn a reward, you will have to get a minimum of three matching symbols in a cluster. The symbol that can trigger the biggest cluster reward is the Joker symbol. It can pay up to 70000 when you get 16+ joker symbols in a cluster. 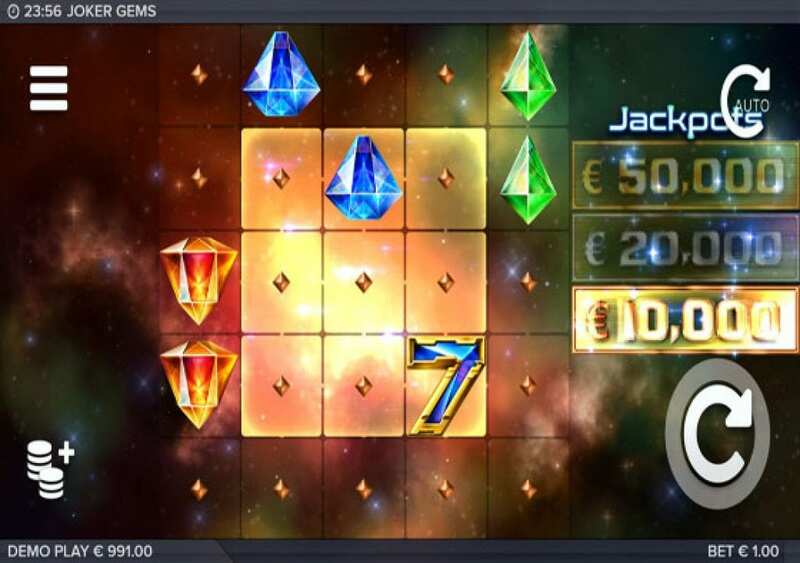 Plus the Cluster Pays, the online slot has a unique feature, the Light Chaser bonus, as well as the three Jackpots. The maximum jackpot can pay up to 50,000. Overall, the slot machine has an RTP of 96.3%. You can view all of the payouts, bonuses and jackpot criteria at the paytable of the slot by clicking on the striped button and then the paytable icon. 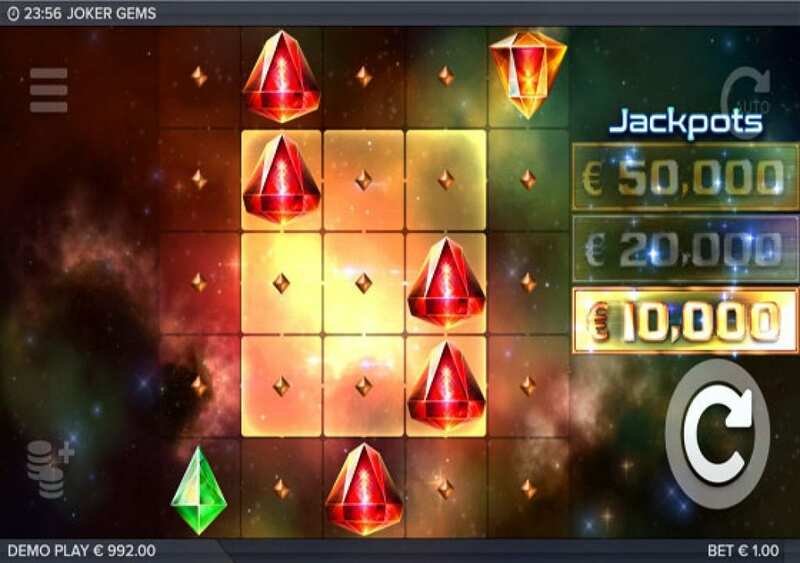 Joker Gems might not have the usual bonus features and unique symbols that other slots have. Therefore you will not find a wild icon, a scatter or a free spins round, the game does not even have paylines. On the other hand, it doesn't mean it does not offer unique features. 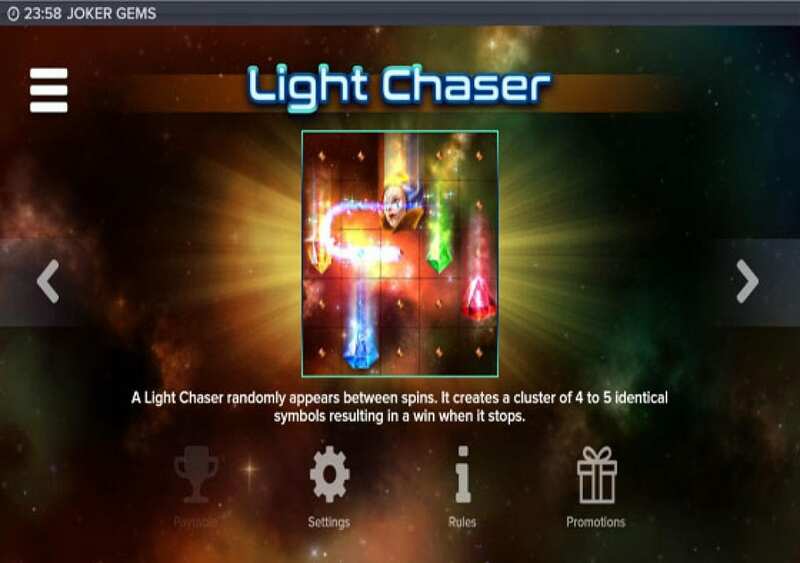 There is the Cluster Pays, and there are jackpots and the Light Chaser Feature. 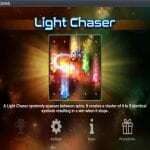 The Light Chaser Feature can become active at random during the gameplay. When that happens, you will see a beam of light making its way through the reels which can result in a cluster of 4 or 5 matching symbols, which can result in great rewards. The slot machine has three jackpots, and they have three different amounts. These amounts are 10,000, 20,000 and 50,000. 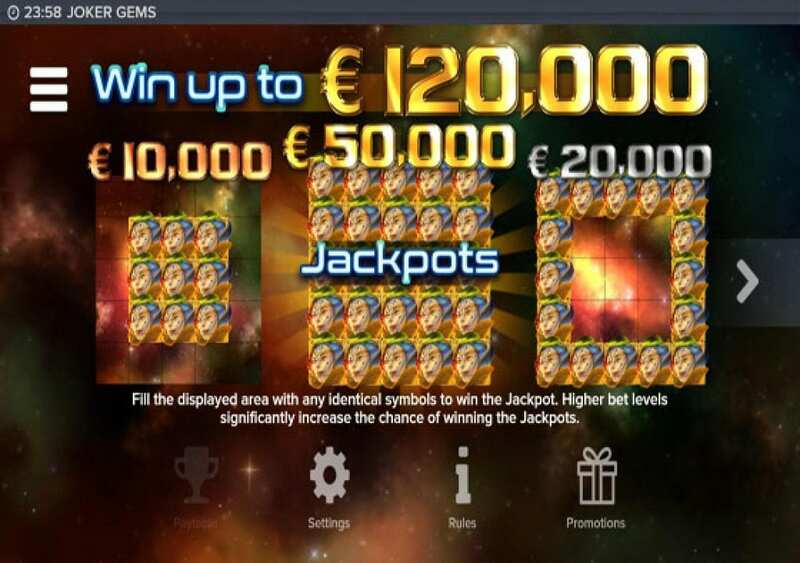 You will be able to trigger these jackpots when you get matching symbols in certain positions. To trigger the maximum jackpot, you will have to get the same symbol on every symbol positions on the reels. 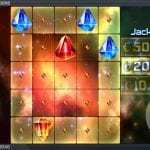 You will have a good chance to trigger the jackpots as you place high stakes.